Lasers have long been the standard of care in medicine and in surgical and cosmetic procedures such as LASIK, wrinkle removal, hair removal and many others. Over the last ten years lasers have become much more effective and predominant in the dental field as well. Their ability and applications have become much broader and the FDA has cleared lasers for use on soft tissues as well as hard tissues for dentistry. 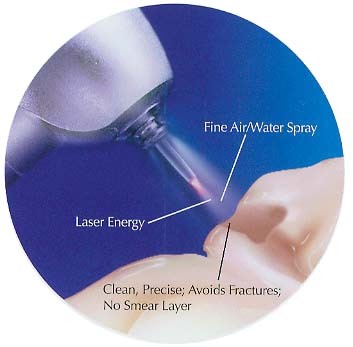 One of the largest advances in laser dentistry was the introduction of the Waterlase Laser. This laser has revolutionized minimally invasive dentistry. The Waterlase laser is an ER,Cr,YSGG laser that emits a wavelength of light that is highly absorbed by water. When water spray is combined with this wavelength laser the water becomes hyperenergized (a process called hydrophotonics). When the high energy water contacts hard tissue (tooth, bone) or soft tissue (gums) it can delicately remove (vaporize) the tissue with precision and ease. Lasers offer a number of benefits when used alone or in conjunction with conventional dentistry. Bacteria is the major reason that causes tooth destruction and gum disease. When a laser is used, not only can it cut hard of soft tissue but it vaporizes bacteria as well. This creates a much cleaner, more disinfected area that allows for better restorations to be placed and faster healing on surgical procedures. Because the Waterlase does not create heat and vibration (such as a drill), it is much more gentle to the tooth and tissue allowing for procedures to be completed with less and in some cases no anesthesia. The laser allows us to be very precise creating smaller holes on the teeth and leaving the maximum amount of healthy tooth structure (minimally invasive dentistry). We feel that laser technology in combination with conventional techniques creates a dental experience that is more comfortable, and dentistry that is higher quality and longer lasting than with conventional techniques alone.